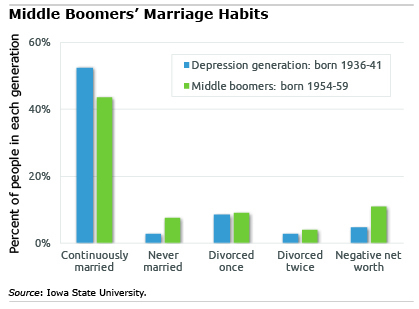 Middle boomers are the “least prepared for retirement” out of four groups studied, the researchers concluded, and their choices around marriage have been important contributing factors. Fascinating. I wonder if this also applies to younger generations as well (GenX and younger). I’m also curious to know how Social Security can be revised to reflect this social development, particularly if it’s likely to repeated in younger generations. Finally, are divorced women more likely to be adversely affected than divorced men? But I’m afraid women are usually affected more by financial disruptions than men, largely because they live longer and also have lower incomes. The financial costs and the division of assets associated with divorce are enormous. In essence, the legal costs and subsequent dilution of assets among parties often results in the newly divorced incurring excessive debt, back taxes, and living expenses as they attempt to maintain or re-establish the living conditions that existed prior to the divorce. The loss of shared benefits and related cost savings (health insurance, retirement funds, disability benefits, shared dependent benefits and expenses) is real and devastating. Often it falls disproportionately on the partner with lower income prospects as any assets or income acquired pursuant to divorce are depleted, yet the costs of supporting a single adult household and any dependents increase. Later in the career cycle (say past 50), the ability to reclaim the lost income and assets is severely diminished. Subsequent marriages frequently involve 2 partners burdened with the losses, debt and responsibilities from a former marriage, negating a net benefit. For those eschewing marriage, it would be reasonable to expect that the unfair tax burden, the difficulty in acquire real property (homes, investments, etc.) that can appreciate, and the cost of any dependents would be prohibitive to funding a reasonable retirement. As one of the four disadvantaged groups — the never marrieds — I agree that it’s harder to afford a home, live on one income, etc. And I envy friends who will retire with two Social Security checks and one or two pensions, adding up to an enviable retirement income. But, there are a few advantages. Although children are wonderful, I did save money by not having them. (I love, but didn’t have to support, my niece, nephews and godchildren). And I’ve had the freedom to move often for better jobs, including international assignments. And now with retirement approaching, there’s no one to oppose downsizing and moving to a more LCOL area. I agree that it’s harder to afford a home, live on one income, etc. Adjusted for class, race, education, etc. (so we compare like with like) women who remain single have 20% lower incomes, Social Security, etc. than men. The gap is bigger for married men because of access to their wives’ wages. Single she gets 80% of A; Married they get 100% of A (male wage) + 80% of (A) or 90% of A, each. In actual fact, men tend to spend more of their wives income than vice versa but women get access to housing and better insurance. Unless the husband is completely useless, earnings-wise, women gain financially from marriage. They gain most if widowed young(ish).